On Saturday October 20, 72 activists from 32 communities gathered in a musty New England church basement to connect, share stories, and think about the resilience of our historic region. The excitement in the room was palpable from the start as folks voiced their thanks and gratitude right away during the opening round of introductions. 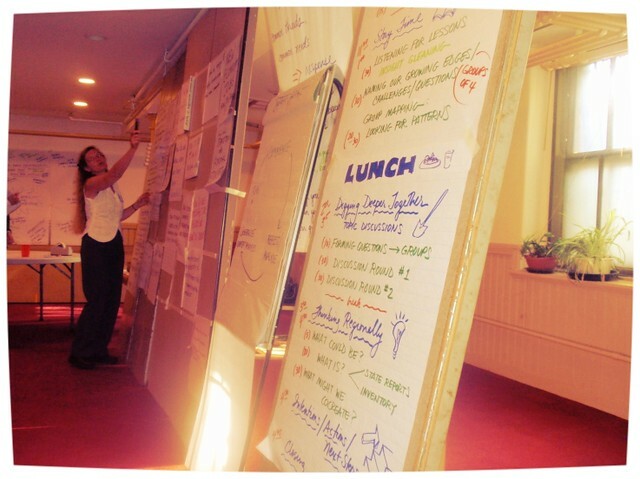 To do the intros, we pushed back the chairs and placed ourselves around the room to create a “map” of New England. Folks from Maine stretching up to our “north” and those from Rhode Island headed down “south.” As people introduced themselves, we found that the room included college students, folks in their 20s, parents and parents-to-be, all the way on up to very “seasoned” activists. We brought an amazing array of interests and passions -- everything from solar panel installation, social media, permaculture, bee-keeping, peak oil financial planning, biking, nature-based spirituality, affordable green housing, and small group organizing, to professional story-telling and pirate jokes. To deepen our connection and appreciation of each other, we then used Joanna Macy’s “milling exercise.” It was a chance to reflect on the importance of the moment we are living in, and the vital role each of us will play in the transition we are facing. Next, we jumped into story sharing. We heard that Transition Putney VT organized 160 events in one year (!! ), and that when Transition Keene (NH) invited an economist to speak about “Move Your Money,” two local credit unions gained 5,000 new members. We heard about a community orchard in an urban neighborhood of Boston MA that has been able to bridge race and class divides, and a “newspaper from the future” from Belfast, ME. 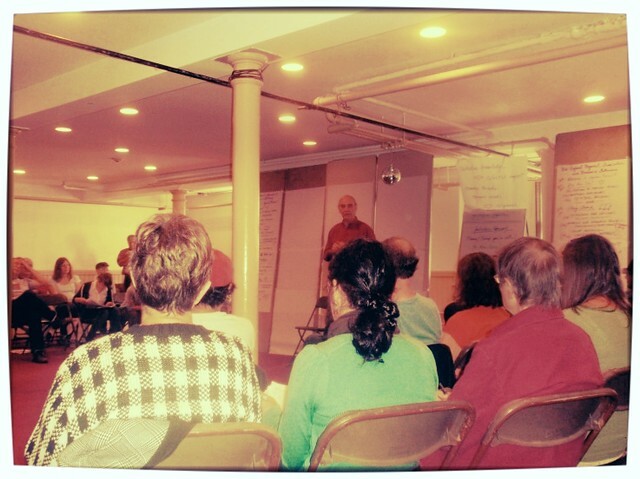 We learned that the Resilience Hub of Portland Maine grew from a 4-person conversation around a dining room table to a 1200-member “ungroup” doing amazing work around permaculture, skillshares, and parties. We acknowledged both the need to be clear about who we are and what we’re doing, and the need to create a language that resonates across barriers. Deep listening and humility were called for, so that we might engage our communities and our neighbors without compromising core values and truths. After lunch and a tour of the nearby community orchard and “Festival Garden,” folks came back energized for roundtable discussions. Topics were generated by the group, including: How do we create continuity within a group and cultivate leadership? What makes for a successful Unleashing? How do strategies differ between urban and rural communities? How do we do Transition on a regional level? As we entered the “what’s next” phase of the agenda, we noted lots of shared regional resources, and identified regional needs. (See our notes here for the lists.) Two “next steps” gathered special enthusiasm: creating a regional website, and having a regional “festival” including celebration, workshops, strategy sessions, and more. Folks volunteered to tackle these and other next steps to increase our connectedness and the resilience of our region as a whole. As each of us has moved back to our local work, I think we all have a renewed sense of the larger community that enfolds and supports us. The work can be difficult and the way unclear, but luckily, we are not alone! Contact Sarah Byrnes (sarah@localcircles.org) for more info and to get involved in New England’s regional plans.